Initial meetings with staff and stakeholders at the start of this project made it obvious that the building we designed had to accommodate a much larger first floor space with a smaller second-floor level. 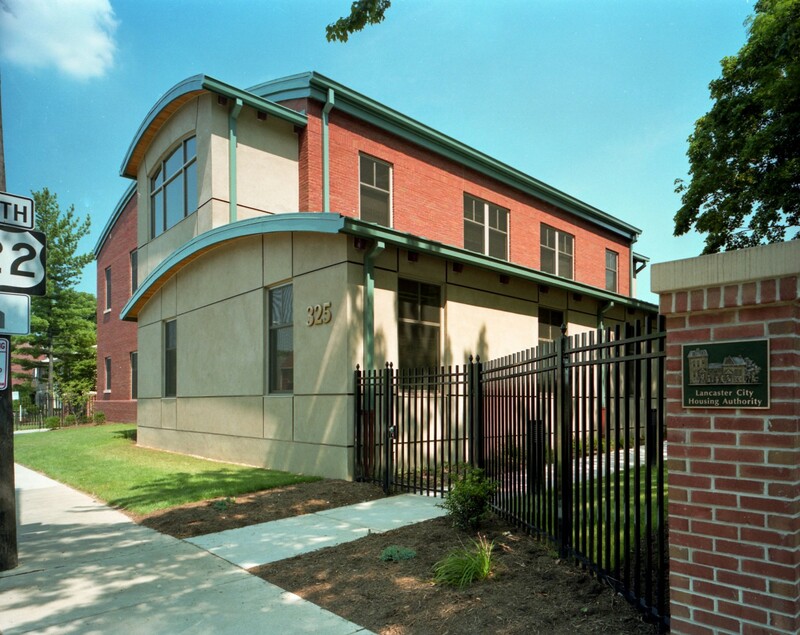 We designed a sculptural form building with a distinctive curved roof, and a brick and stucco exterior. The brick integrates the building with the characteristics of other buildings in the city, while the use of stucco on the veneer allowed us to contain costs, an important requirement for this public project. The office building is located on what was an undeveloped portion of the Church Street Towers public housing site. The arch shape is a common design element used in windows, doorways and openings of buildings throughout the city. The stucco portion of the building makes it easy to identify the main entrance. The circular reception desk reintroduces the arch shape of the exterior in the main lobby. 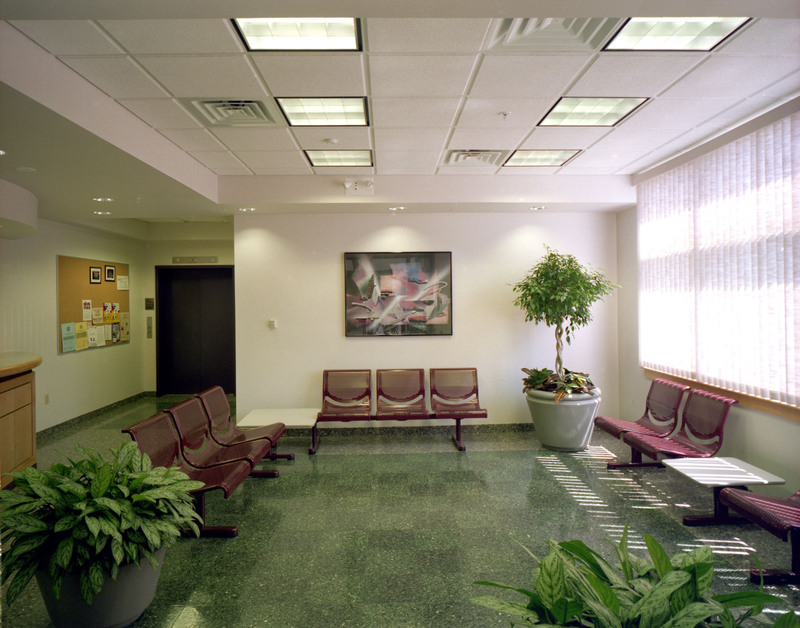 Terrazzo tile floors and vinyl-coated wire framed chairs were chosen to create an upscale look in the reception area while maintaining costs and providing durability in this heavily used public area. 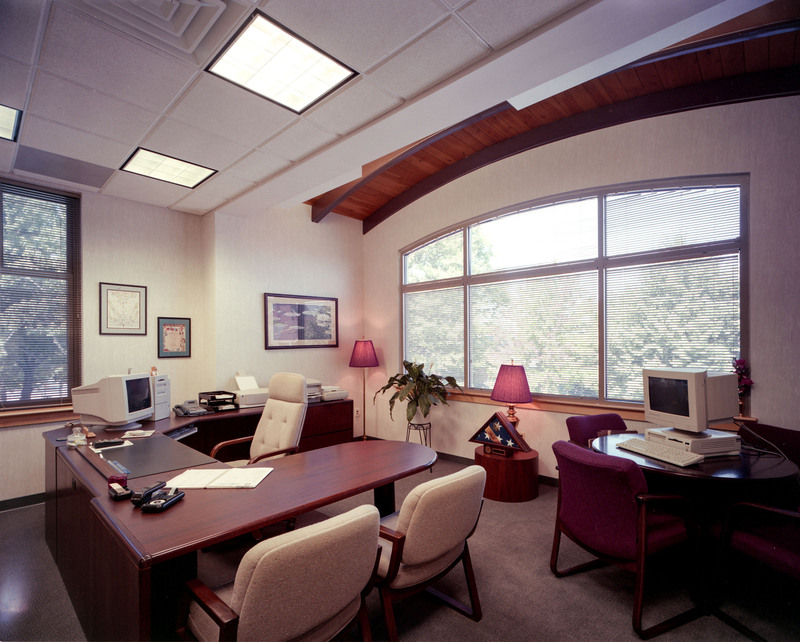 Ceiling soffits are integrated into the design to define the reception area, with recessed lighting and a bank of windows offering a sunny welcome to visitors. 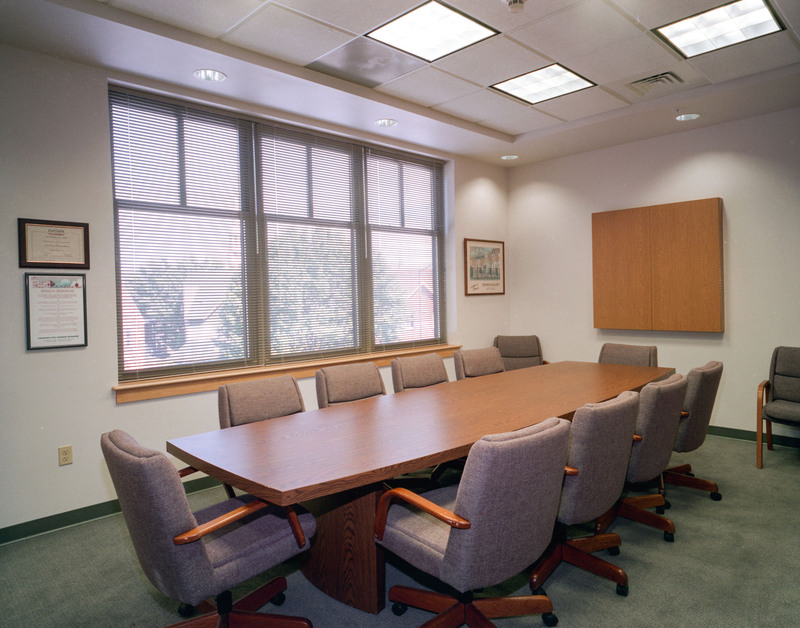 The conference and meeting room is located on the second floor, along with executive offices. By locating this essential space adjacent to the Director’s office, we were able to scale that office to a smaller size. The grouping of windows along the exterior wall adds pleasant natural light and connects the room to the cityscape beyond. 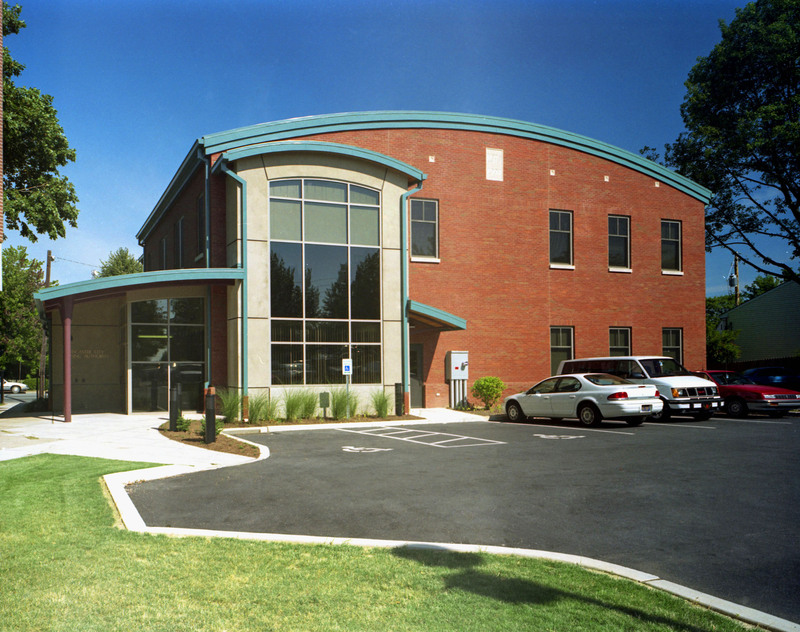 Featuring a distinctive arch-top triple window that is part of the large curtain wall visible from the exterior of the building, the manager’s office is on the second floor above the waiting area. Exposed wood joists and a structural wood roof deck are used as design elements to further enhance the office interior. Lending consistency to the overall design of the building is a feature wall in the elevator lobby, which uses the same arch segment as the roof shape. 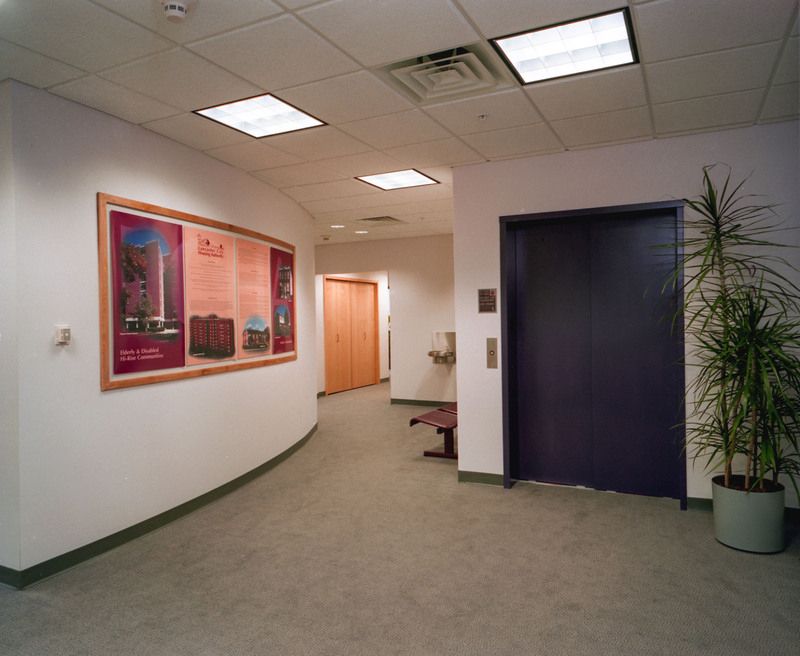 A dual-use passenger and freight elevator offers convenience for visitors and all employees, with storage for the maintenance department located on the building’s basement.